In his latest article on the Eurozone, Ambrose Evans-Pritchard points to the collapse of demand for credit in the Eurozone (hat tip Greg Merrill). The Telegraph: - The long-feared credit crunch has mutated instead into a collapse in DEMAND for loans. Households and firms are comatose, or scared stiff, in a string of countries. Demand for housing loans fell 70pc in Portugal, 44pc in Italy, and 42pc in the Netherlands in the first quarter of 2012. Enterprise loans fell 38pc in Italy. 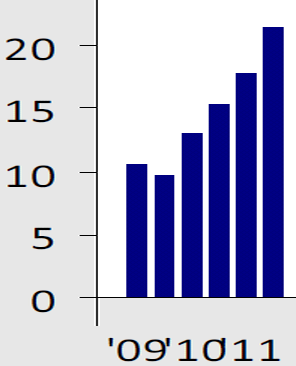 The survey took place in late March and early April, and therefore includes the second of Mario Draghi’s €1 trillion liquidity infusion (LTRO). This blanket assessment however is not entirely correct. 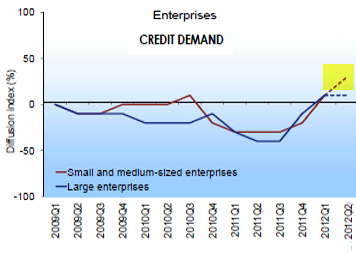 In certain Eurozone nations demand for credit, particularly from small and medium size enterprises still exists. This demand is not always about expansion. Many of these businesses rely on credit to finance inventories, meet payroll, etc. The problem is often the declining availability of credit. Let's take a look at Portugal for example. Here are the results from Banco de Portugal (Portugal's central bank) survey of the nation's credit conditions. 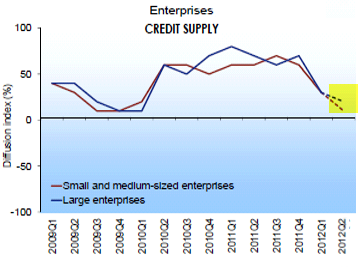 The assessments of credit for enterprises clearly point to rising demand and dwindling supply (dashes indicate the expectations of credit institutions). Mr. Evans-Pritchard rightfully points out that demand for credit from households has declined dramatically in the past couple of years. But that is not new. The largest credit demand declines from households in Portugal took place in late 2010 to early 2011. In fact demand for mortgages is expected to reverse the declines (though ever so slightly) in 2012 Q2 as household formation takes its course. The problem is that the supply of credit for mortgages is expected to decline just when the demand begins to stabilize. A survey from the ECB (hat tip Kostas Kalevras) also points to an increasing demand for credit that corresponds to dwindling supply. Below are the responses of small and medium-sized enterprises in Portugal that identified "access to finance as the most pressing problem" (percentage of respondents). It is likely that many households and businesses, keenly aware of the lack of available credit, are simply not seeking new funding now, which translates into what looks like declining demand. 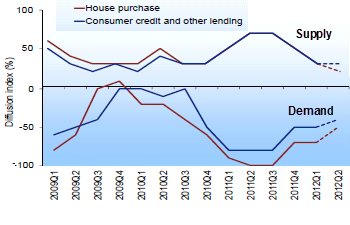 But at least when it comes to credit conditions in Portugal, the problem is the lack of supply, not the demand.